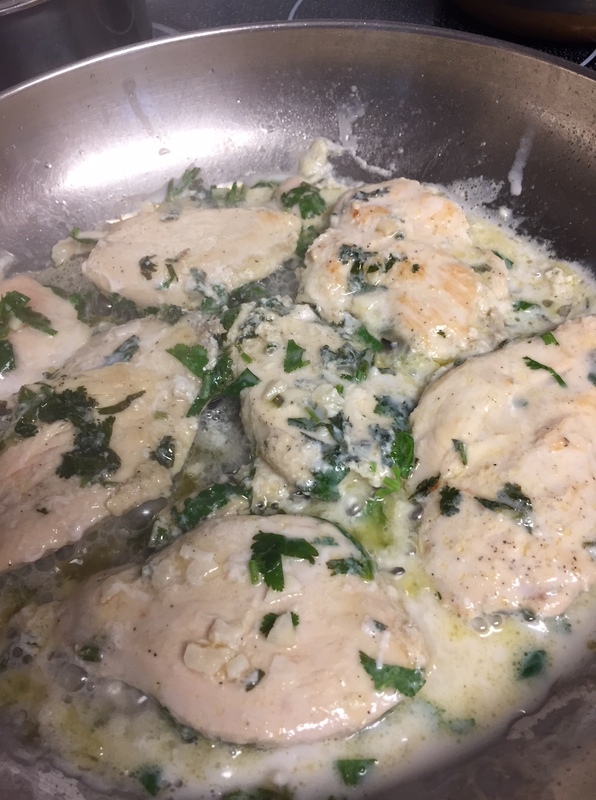 I marinated chicken breast, cut thin, in lime juice, olive oil, cilantro, salt, pepper and garlic. Then, I just fried it up in a pan. I cooked pink rice and mixed vegetables. I also offered these chicken filets up in buns for those who wanted them that way–with toppings like lettuce, etc. Patsy and Rob went for them that way. On Thursday, everyone got what they wanted for themselves as they left to take Ja’Ana to tap dance class before I got home. Patsy told me she made an egg salad sandwich from some eggs I boiled and left in there. I sauted up a few shrimp we had lingering in the freezer and had salad and a baked potato Rob left. So, I’m guessing he had potatoes? Or leftovers? Anyway, everyone ate! On Saturday night, I made waffles, eggs and bacon. I will put up a picture of the waffles soon–they were so cute! I made them in a Mickey Mouse waffle iron I got at a yard sale last weekend. Jake was here for dinner, but the girls were not. They had harvest parties and got their dinner there. He ate an ear from Mickey, a few eggs, and lots of bacon. Later in the evening, he ate a bagel, too. I try to always keep them here for him, as he eats one almost every time. I made a berry cobbler and a rice salad with the leftover pink rice to take for Family Sunday Dinner tomorrow. I also ground some turkey I found in the freezer so it will be handy for sandwiches. 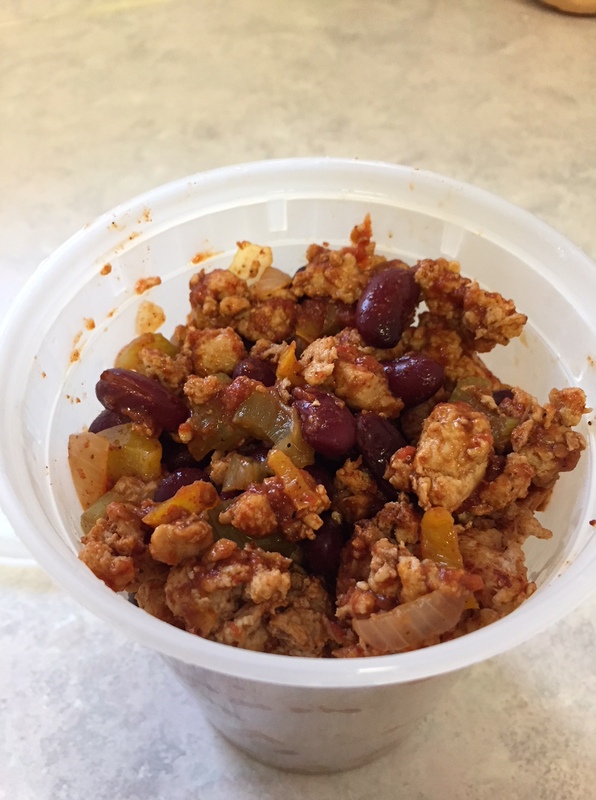 Last weekend, I made this mixture of turkey burger, celery, yellow peppers, kidney beans, chili powder and crushed tomatoes. 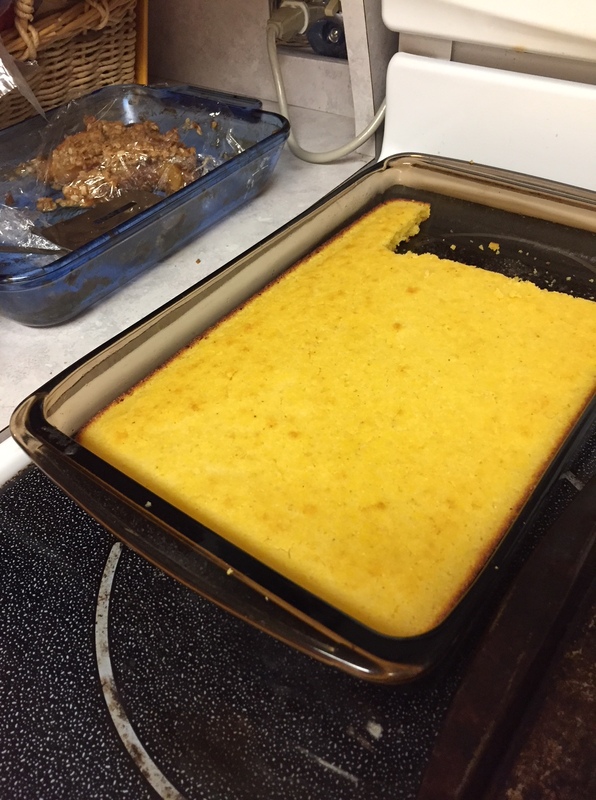 I was going to make tamale pie one night by just putting cornbread on top and baking. 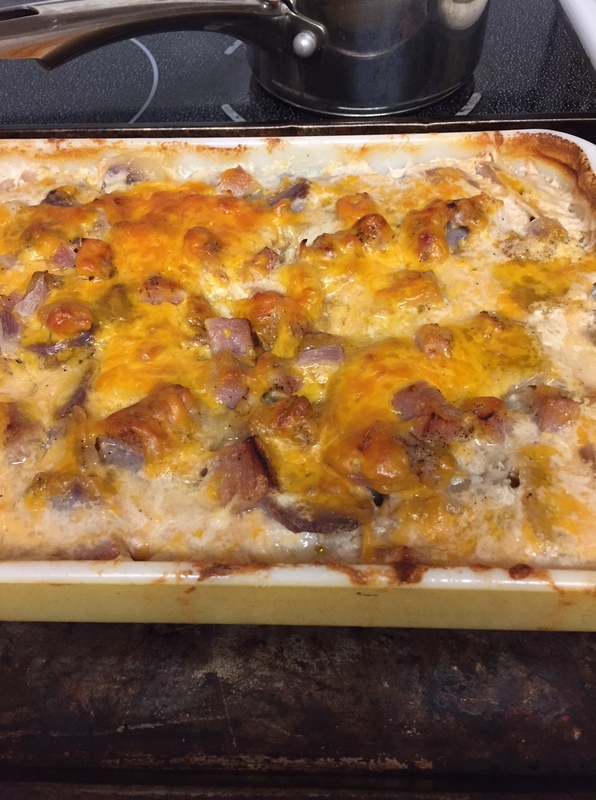 Instead, it got used at odd times for baked potatoes, tacos, salad, on a plate….I’m fine with that. It got used, but for a little bit, and made grabbing something for lunch very easy. I could have added macaroni, too, for chili mac. I will probably make another batch of it soon. 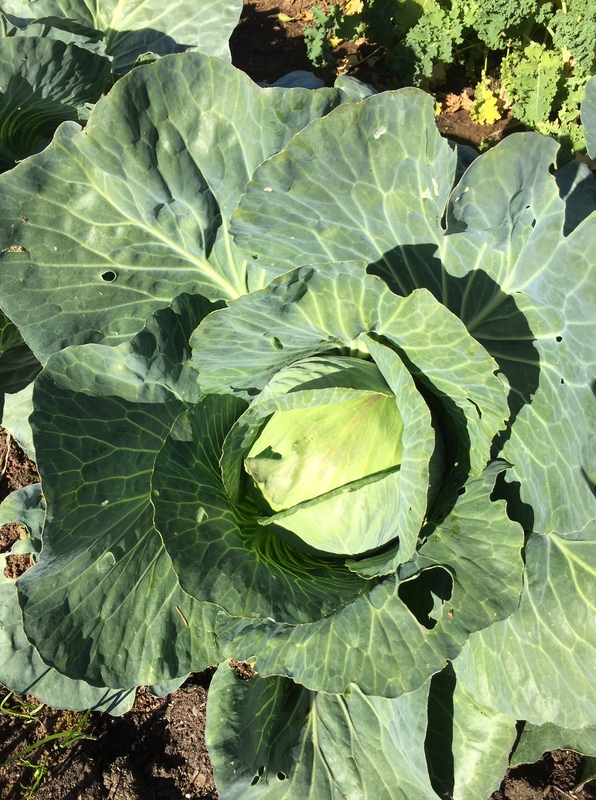 I picked a cabbage today. It is in great condition. I plan to use it for coleslaw this next week. I feel like we ate well last week, and that I have a good handle on the upcoming one. By the end of tomorrow…I should be in super-great shape as far as the food for the week in concerned. Yum! We love scalloped potatoes, too. Making them from scratch seems to be a lost art these days. We came to the lake 8 days ago and I had a carefully planned menu and most food brought from home. Ran into town to pick up the rest of what we needed at Aldi to find it closed for renovations. We rarely go to Walmart but with few choices here that is where we ended up and found prices to be less than Aldi. Now we have decided to stay another week so I am being creative with food on hand. We have avoided eating out day after day which is a real trap here. I did make a big pan of Mac n cheese and put some containers of it in the freezer to take out as wanted. We also stocked up on canned veggies as they were 38 cents a can at Wally World so we have those. My goal is to eat what we have on hand and not to buy a bunch more food to haul home. Feels like a pantry challenge! Yes, it would feel like a pantry challenge! I understand why you would not want to haul too many groceries back and forth, back and forth:) I’m glad you can stay up there for another week! I know you love it there. Scalloped potatoes and ham are the ultimate comfort food. My hubby would eat the whole casserole dish full in one swoop if I let him. LOL! Everything looks so good! Chili sounds wonderful. I need to make it again. Patsy may not “be hungry” for a lot of food, but she’s always “hungry” for chili. We all love it!